Foramen Magnum is the largest foramen situated on the base of the skull through which multiple structures pass including the Spinal Cord. It acts as a passage between the cranial vault and the base of the skull. So let us look at all the other details regarding the Foramen Magnum like its location and the Structures which are passing through it. The Foramen Magnum is located in the base of skull and if we go into the details, it is situated in the occipital bone and it appears to be formed around the base of medulla oblongata. Surrounding the Foramen Magnum there are four bones, namely para squama, left and right pars lateralis and pars basilaris. The Foramen consists of two important points, the opisthion which is the midpoint on posterior line of the foramen and the basion as the name suggests the midpoint on anterior margin of the foramen. 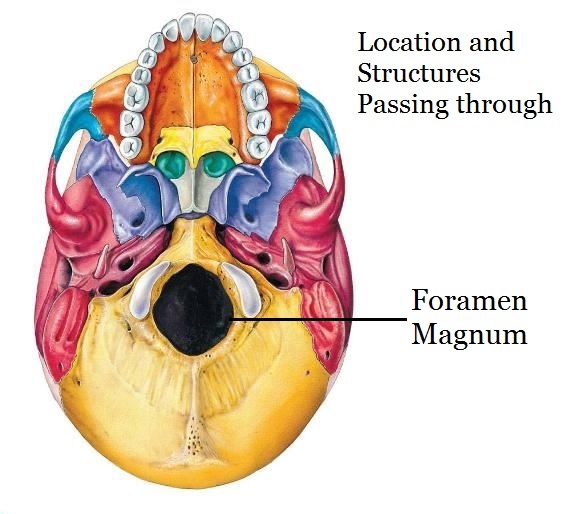 What are the list of structures passing through Foramen Magnum? The Foramen Magnum is the largest among the foramen of the skull and the major portion is taken by the Spinal Cord but apart from this major structure there are other structures passing through which are listed below. There are multiple foramen present on the base of the skull which act as a path for many structures to pass through them. Click on this link to see the complete list of the Foramen of Skull and the structures passing through them.